Deeply cleans and purifies scalp and hair affected by dirt, pollution and grease. Everyday, you do what it takes to get the job done. But on some days, it leads you to prolonged exposure out in the sun. Urban environmental stressors like dirt, pollution and residues can get trap in your scalp which may cause dandruff. 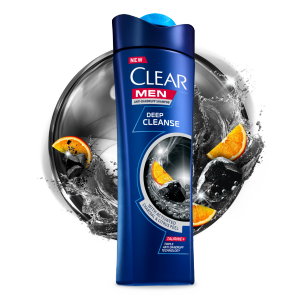 Specially made for men, CLEAR Men Deep Cleanse Shampoo infused with Activated Charcoal and citrus peel, deeply cleans pores^ and leaves your scalp fresh and healthy. One less worry on your rise in your career. CLEAR Men shampoos are formulated with Taurine and Triple Anti-Dandruff Technology to activate scalp to remove, resist and prevent* dandruff. End recurring dandruff*, for 100% confidence’. 1.Apply to wet hair & scalp. 4. For best results use everyday. 5. Avoid contact with eyes. 6. If eye contact occurs, rinse immediately. 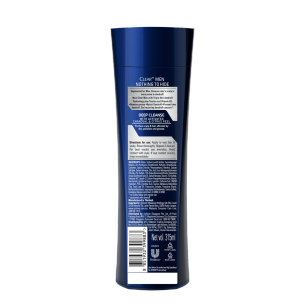 New Clear Men with Taurine and Triple Anti-Dandruff Technology, consist of Guar BB18, Niacinamide (Vitamin B3) and Amino Acid, to energize scalp's self defence** to remove, resist and prevent dandruff*. End recurring dandruff concern* with CLEAR. Activated Charcoal and Citrus Peel are known to absorb and neutralise grease, and nourish scalp. Boost scalp’s self-defence. End recurring dandruff concern. Here’s the scoop on how to get rid of that grease for good. Ladies, your scalp care regime starts here. Keep scalp healthy and get healthy-looking hair with our easy tips. Ladies, the best treatment for your scalp starts at home. Can an apple a day keep bad hair away?